Greetings from Durban, South Africa! We arrived on March 9th at 9:30PM. We have been spending the last few weeks getting acclimated to living in a new country. At first we had a hard time trying to find a place to live because we couldn't provide proof of local income since we just moved here and are supported through our US based ministry. However, we met a lady who is a believer and after she found out what we do, she understood why we are here and agreed to allow us to rent her place. As a result, our landlady, whose mom was diagnosed with some sort of bone cancer in her leg, wanted us to pray for her mother. One evening we went to their house, which is across the street, to return a ring we found while cleaning our new place. When they invited me in, there were other family members present and the mother told the others that I had a "healing" ministry. Since she introduced me in that fashion, I thought, "Well, I have to pray for people if they'll let me!" One lady had a problem with her shoulder and she was healed. I prayed for our landlady's mother and as I prayed for her leg, her muscles started to contract and contort a little. I looked at her face and she looked as if she was in pain. I kept praying until her leg relaxed. I asked her what had happened and she stated that as I prayed, pain shot down through her leg and out of her foot. I continued to pray but there was no more pain this time. They invited us over for dinner four days later and after dinner the mother stated that she believed that she was healed but if not, she stated that God wanted her to suffer in order to be able to minister to people with cancer. We shared Matthew 8:16-17 where Jesus healed all that were sick in order to fulfill what was spoken by Isaiah the prophet and that we don't see Jesus anywhere in the Gospels refusing to heal anyone so that they can learn compassion. We were also able to minister much more to the mother, father and our landlady from the Word of God. They all really received what we were saying and didn't resist anything we said to them. The father, who is greatly involved in the Methodist church here in Durban, has invited me to minister the Word in their church on April 25th. This is the first time for me to preach in a Methodist church! 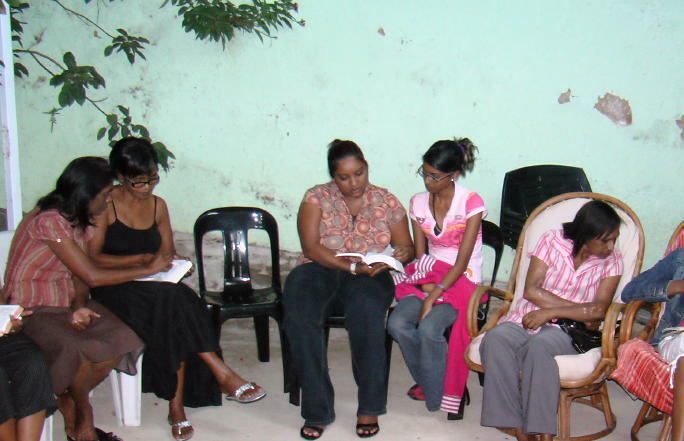 We also started a Discipleship group with about 15 people last week, with a small church. They all liked it and commented how the teaching was clear and easy to understand and how they were greatly blessed. On a humorous note, we would like to introduce you to some of our other neighbors. 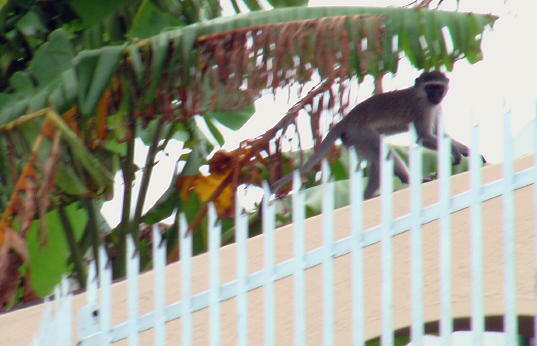 Monkeys!!! Yes, that's right! 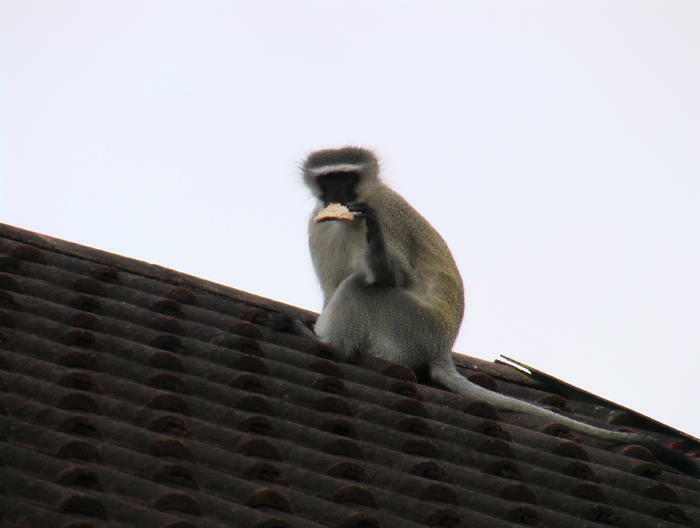 We have REAL monkeys living in our area. You have to be careful, because if you don't watch your doors, they'll come right in and steal whatever you have in your house, to eat of course!! They'll steal your fruit, bread, and whatever they think might taste good to them and then laugh at you as they run out!!! In order to partner with what the Lord is doing through KEMI, there are different ways that you may do so. You can use the coupon at the bottom of this letter and mail it with your check in the enclosed envelope or you can go to our website www.kemi-inc.org where you can donate online using your credit or debit card. You may even set up a monthly partnership online where each month, your donations will be automatically sent to our ministry. Also, on our website, you can find out more information, watch video teachings and testimonies, listen to audio teachings, and more. With your help, KEMI Inc. will be able to increase its ministry throughout the world. Remember, none of this is possible without you. You make it possible to reach people with the Good News of the Gospel and to train ministers. We thank God for you and those whose lives are being changed, they thank you too! If you would like to become a partner with us, you may do so by clicking on the the following link.